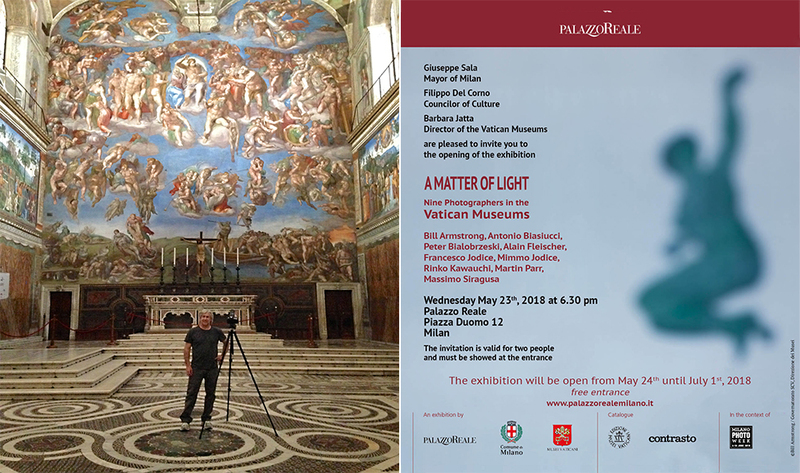 The unique project presents nine international photographers who have strived to interpret the complex reality of the Vatican Museums. Working in different times and on different aspects, Bill Armstrong along with Peter Bialobrzeski, Antonio Biasiucci, Alain Fleischer, Francesco Jodice, Mimmo Jodice, Rinko Kawauchi, Martin Parr and Massimo Siragusa have created nine different works that document and interpret the interior and architectural space in one of the rooms, the flow of visitors and the memories that animate people and environments on a daily basis, the signs of use and traces of bodies, the works on display and those stored in the archives. For the exhibition, Armstrong was invited to appropriate the images of Michelangelo and transform them using his unique process in the manner of his “Renaissance” series. One of the images he created was used to illustrate the exhibition catalogue, which will be published in both Italian and English.